The first three months of the year saw the highest first quarter take-up of Dublin office space ever recorded, new figures show today. Property consultants CBRE Ireland said a total of 107,200 square metres of transactions were signed in the Dublin market in the first quarter of the year with the market boosted by a number of large transactions including a number of pre-lettings. CBRE said that 49 individual office lettings occurred in Dublin in the first three months of the year with 32 of these deals with Irish companies. UK companies accounted for 10 transactions, while there were four lettings to US companies in the three month period. 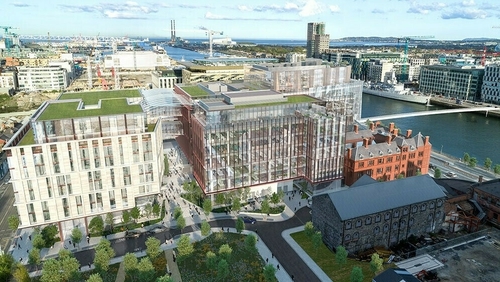 The property consultants said that three of the 49 transactions extended to more than 9,290m2 and included pre-lettings to Salesforce and the Central Bank in Dublin's North Docklands. It said this proves that new requirements continue to emerge as existing ones are satisfied. More than two thirds of requirements at the end of the first quarter were specifically focussed on Dublin city centre, CBRE added. Meanwhile, the value of office investment transactions (extending to more than €1m) in the Irish market during the first three months of the year stood at over €322m and accounted for 47% of investment activity in the Irish market. Another €5.1m of mixed-use deals (some of which included office properties) were also signed in the three-month period. Prime office yields in Dublin remained stable at 4% but CBRE said they may compress a little over the coming months as new transactional evidence materialises. Today's report also shows that 30 office schemes were under construction in Dublin city centre at the end of the first quarter, extending to more than 370,000m2 between them. "It is important to point out that a large proportion of the office stock (47%) that is under construction in the capital has already been pre-let or is reserved, meaning that occupiers cannot afford to get complacent and put off location decisions in the hope that a large volume of stock will come available over the next two to three-year period," commented Marie Hunt, executive director and head of research at CBRE Ireland. Today's report also shows that the overall rate of vacancy in Dublin fell in the first quarter of the year to 5.39% from 6.09% last quarter and 5.96% this time last year. The overall rate of vacancy in the suburbs at the end of March was about 6.21% compared to 6.66% three months ago.